Animals – No pets are allowed inside facility. ATMs - ATMs are not available at the speedway. Bank card purchases in office can get up to $50.00 cash back with purchase. Camera & Video Equipment – Cameras and personal recording devices are welcome at the speedway. Tripods and other support equipment are not permitted. 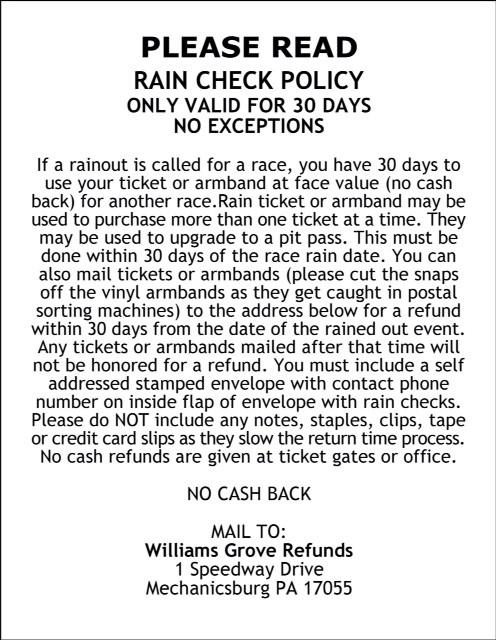 Selling Photos & Live Streaming of Williams Grove events is PROHIBITED without written permission from Speedway. Camping – Fans wishing to camp for a non-World of Outlaws race may do so free of charge, beginning at Noon on race day along Speedway Drive (front stretch parking lot) and along the tree line in the Beer Hill (Turn 3) parking lot. Reserved and Unreserved camping is available for World of Outlaw weekends. The campground for those events open 1 day prior to the first race of the weekend. First Aid – First aid is provided by local EMS, located at the infield ambulance. Fuel – Williams Grove Speedway offers racing fuel at all racing events, located in the infield supplied by VP Racing Fuels. Golf Carts – Golf carts are allowed in our campgrounds and parking lots, if they are registered and insured. No ATVs are permitted. Golf carts entering the speedway will only be permitted with registered teams. Golf carts must obey traffic signs located around the speedway. Lost and Found – Guests may inquire about lost and found items at our speedway office during events or call during office hours 717.697.5000. Merchandise - Our apparel provider Fast Tees, has three locations set up at the speedway during events. They are located behind the front stretch grandstand, the infield and on Beer Hill (Turn 3). Parking – Parking is available around the front stretch side of the speedway, outside of turns 3&4 and behind the backstretch. Each parking lot has its own entrance. Overflow parking maybe be available across the street from the speedway for larger events. Parking is free for all events. Pit Access – Williams Grove Speedway has two different pit areas. One on the inside of the speedway and the other on the backstretch. The front pit can be accessed from the infield of the speedway. The back pit can be accessed from the backstretch grandstands or from outside the speedway though the backstretch gate. Pit passes can be purchased for any racing event (No advance sales) from the turn 1 and backstretch ticket booths. Minors under 18 & under must complete, with a Parent or Legal Guardian, a Minors Assumption of Risk and Release and Waiver of Liability form before entering pits (this only needs to be filled out once for the season). Restrooms – There are three permanent restroom facilities around the speedway located behind the front stretch grandstand, the infield and on Beer Hill (Turn 3). Temporary facilities may also be available around the speedway during larger events. Seating – There are six permanent bleachers located around the speedway. The top rows of the grandstands are for season reserved seat holders (seats marked in red). The next rows are reserved for World of Outlaws events only (seats marked in yellow). All other seats are general admission and pit band. Seating is also available in grass area of the infield. Smoking - Smoking (E-Cigs included) is not permitted in the grandstands or within 15 feet of any concession stand. 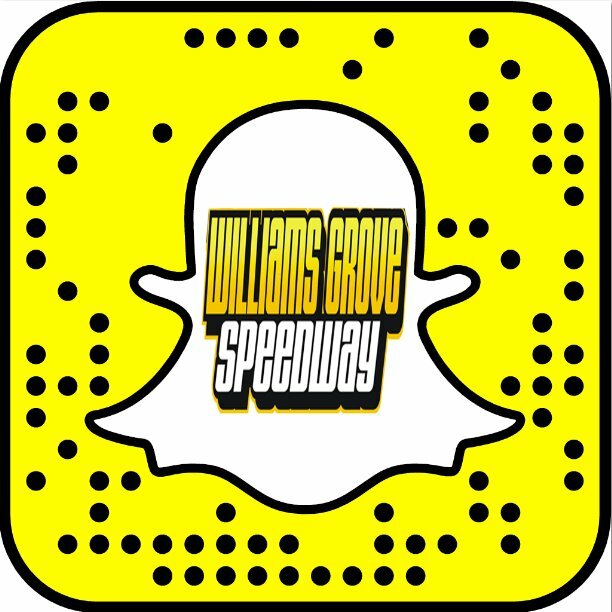 Social Media – Williams Grove is active on many of the most popular social media outlets. Our pages provide information on upcoming races, along with results, special features and anything related to the speedway. Timing & Scoring – Williams Grove Speedway uses Race Monitor for live timing & scoring during racing events that can be accessed on any smartphone. A television is provided for viewing behind the front stretch grandstand. Weather – Inclement weather can affect our racing program. For weather updates and cancellation information, we highly encourage fans to subscribe to	www.rainedout.com Or follow us on our social media outlets. If 50% of the event is completed it is considered a completed event.